As anyone who has read this blog for more that about five minutes will know, I have a bit of a thing for Lego. My passion for the little plastic brick has only been enhanced by the fact that my son is now old enough to enjoy proper Lego for himself. I also have a bit of a thing for steampunk. (No! Really?) Carry out a quick search on this blog and you're find links to all manner of steampunk devices, vehicles and characters rendered in Lego. And here's another one for the collection. 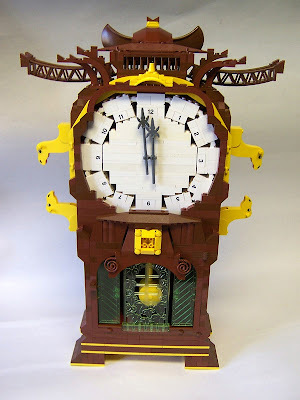 This time it's a Lego Steampunk Clock, created by Matt “monsterbrick” Armstrong. You can find out more about this incredible invention here.